An Historical and Pictorial Map of Casco Bay Maine. 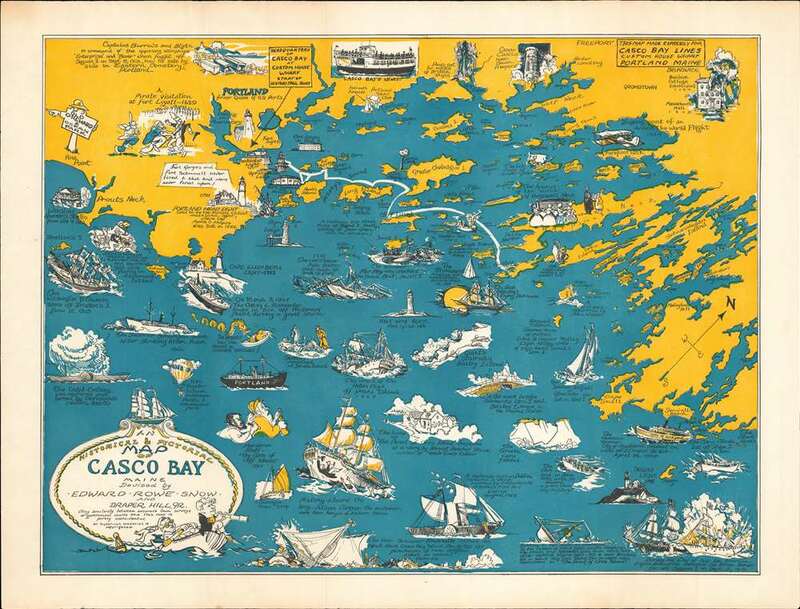 This is a charming c.1950 pictorial and historical map of Casco Bay, Maine by Edward Rowe Snow and Draper Hill, Jr. It covers Casco Bay, an inlet of the Gulf of Maine on the southern coast of Maine, from Prouts Neck (Scarborough Beach State Park) east as far as the southern portion of Georgetown Island, including the city of Portland. Throughout, the map notes towns, islands, capes, points and a few other topographical features. The main focus of this map however, are the several pictographic and historical depictions throughout the map highlighting this nautical region’s history and heritage. Several landmarks have also been attractively illustrated, including the Portland Head Light, Munjoy Hill Observatory, Casco Castle near South Seaport, Seguin Light, etc. Some of the historical events recorded in the map are ‘The Caleb Cushing was captured and burned by Confederate raiders, 1863’, ‘A pirate visitation at Fort Loyall – 1680’, ‘The monument A refuge for shipwrecked sailors - built in 1827’, ‘Skeletons unearthed at Jewells Island’, ‘A pot of gold discovered by John Winslow’, and several others. This map is considered a 'figurative map' or a 'decorative map,' and reflects a style that first began to appear around 1910. As a map, its intention is not so much to provide direction as to illustrate the character, famous places, and historical appeal of Casco Bay. Cartographically speaking, this map style most likely draws its inspiration from late 19th century 'tourist maps' and 'railroad maps.' Tourist Maps, common to major cities in Europe (usually Paris or London), included profiles of notable buildings and monuments and were designed to help foreign tourists identify and navigate to the most important sights. 'Railroad Maps' are a related genre more common to the United States. During the latter part of the 19th century railroad boom, railroad companies began issuing decorative route maps extolling the virtues various regions and their accessibility by rail. Standing somewhere between this two map styles, our map combines the decorative aspects of both while reducing cartographic value. It may be hard to get from A to B using this map, but its attractive design and decorative flourishes, make it an excellent souvenir and memento of a wonderful Casco Bay vacation. A note in the title highlights the same ‘Any similarity between accurate town surveys or government charts and this map is purely coincidental. All historical material is copyrighted’.